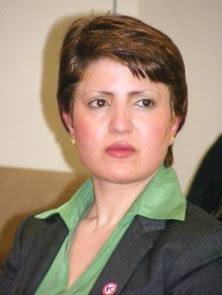 Widad Akrawi, a Kurdish author, politician, lecturer, and a devoted human rights activist. She was born in 1969 in the city of hospitality, Akre (in Southern Kurdistan). She relocated to Denmark in 1992, which is where she studied at the Technical University of Denmark and maintained a living by working as a geneticist at the Royal Hospital in the capital city, Copenhagen. She dedicated lots of her time volunteering for Amnesty International, Danish section (April 30, 2006 – June 18, 2007). She is currently the chair of Defend International and working with the International Action Network on Small Arms. She is a board member for International Women Steering Committee, Women of Europe Award. In addition, she is the author of the book "Taras bog: En beretning fra Kurdista, novel in Danish , 265 pp., Forlaget Forum, København, 2003." On October 22, 2007 she traveled to New York City on an invitation by the IANSA (The International Action Network on Small Arms) to be present at the United Nation’s General Assembly as Defend International’s representative. IANSA is a global movement against the misuse of small arms and light weapons. As the representative of DI and a human rights defender she is committed to making our world a better place from the abuse of small arm. The "One Day ..." is coming !